The Asia-Pacific Communication Monitor 2017/18, a survey of more than 1,300 communication professionals working in corporations, government, non-profit organisations, and communication agencies across 22 Asia-Pacific countries, has identified the impact of digital technologies, social media, mobile communications, and the need for a strategic focus to align communication outcomes to organisational goals as the four top issues facing communicators. 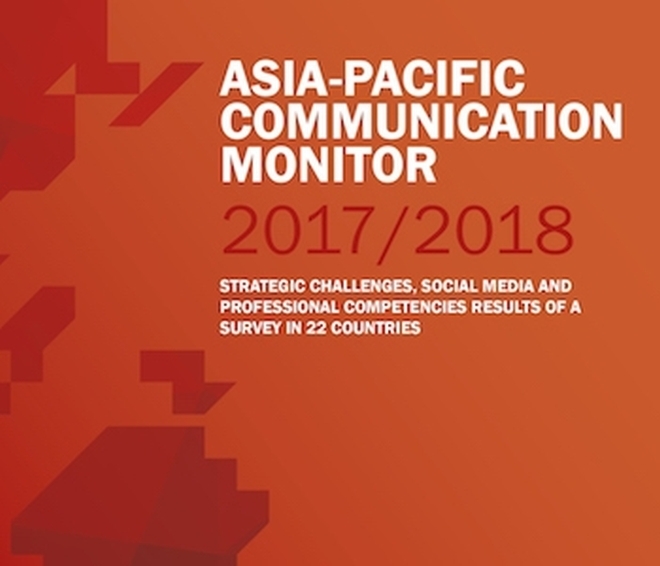 Following its launch in 2015/16 as a bi-annual survey as part of the global Communication Monitor series across more than 80 countries, The Asia-Pacific Communication Monitor 2017/18 provides valuable understanding of the communication industry in Asia-Pacific and insights into its future. The inter-related ‘top 10’ findings of the Asia-Pacific study were as follows. Coping with digital evolution and the social web is the most important strategic issue facing the communications profession over the next few years, including dealing with the speed and volume of information flow. There is strong growth in mobile communication, with 83.8 per cent of practitioners rating mobile communication via phone or tablet applications and mobile websites as collectively the second most important communication channel after social media and social networks. Media relations with print newspapers and magazines has slipped substantially from being the most important channel for communication with stakeholders and audiences (76.5 per cent rated these media as important in 2015/16) to the eighth most important channel (61.5 per cent in 2017/18). Their importance is predicted to decline even more by 2020, as are media relations with television and radio networks. More than 70 per cent of practitioners agree that social media influencers represent a new type of third party endorser who shape audience awareness and attitudes and are thus important in their organisation’s communication strategies. Influencers need to be addressed through social media influencer (SMI) engagement. Of concern though is that more than two-thirds (66.7 per cent) of practitioners rate their social media skills as highest for using social media to deliver messages, compared with lower ratings for managing online communities (44.0 per cent) and initiating online dialogue with stakeholders (39.0 per cent). This shows that the interactive two-way communication affordances of social media are not well used. Despite its identified importance, only one third of practitioners (34.9 per cent) say that linking business strategy and communication is a top priority in the near future, while 28.6 per cent believe that the role of communications in supporting top-management decision making needs to be strengthened. Both issues have declined in importance compared to the 2015/16 survey. However linking communication to business goals is ranked second in the overall list of key issues to address. Asia-Pacific professionals are behind their European colleagues in this respect. The need for development identified in this study underlines the concerning finding of the previous APCM survey, which reported stasis in the development and use of measurement and evaluation. Operational communication activities dominate professional work in communication, making up one-third (32.8 per cent) of all tasks and practices. This includes talking to journalists, writing media releases, and organising events. The second largest proportion of work is devoted to management activities such as planning, organising, budgeting and leading staff. Only one-fifth (20.5%) of the work of communication professionals is focussed on strategic and reflective activities to align the organisation or client and its stakeholders and publics, and discussing strategies with senior management and other departments. This is consistent across all types of organisations and is consistent globally. Communication professionals working in media relations and acting as a spokesperson, including in social media, have the highest operational workload. Job satisfaction of communication professionals in Asia-Pacific declined in 2017 compared with findings of the 2015/16 Asia-Pacific Communication Monitor. The 2017/18 study found that only 56.6 per cent are satisfied with their job, compared with 65.4 per cent in 2015/16. Also, ‘neutral’ satisfaction ratings rose to 30.9 per cent compared with 11.7 per cent two years agoCommunication professionals agree that continuing professional development is important. However, availability of professional development does not align with key areas of need. For example, while technical knowledge is rated a high priority by most practitioners across the region, only 4.0 per cent of practitioners in New Zealand, 9.3 per cent in Malaysia, 11.6 per cent in Australia, 12.9 per cent in Hong Kong, 14.1 per cent in India, and 14.9 per cent in Japan report that such training is available in their organisation. The findings of the Asia-Pacific Communication Monitor help identify best practice, areas for professional development, and academic courses, and contribute to global data on the public relations, corporate communication and related fields. The full report (116 pp., PDF) can be downloaded free from www.communicationmonitor.asia. Alternatively, read the full report on Slideshare.